Spotlight on Marvest: Ghostly Hounds - Spotlight Ottawa	:: Spotlight Ottawa - Your local music scene. Get out and experience it! We found out we were going to be a part of Marvest while we were nearing the end of a two month tour. We were very excited but didn’t tell anyone right away because we were still on the road. We combine strings, horns and powerful vocals to create a dark, jazzy sound. Francesca had been performing as a solo artist for just over a year when she met the band. 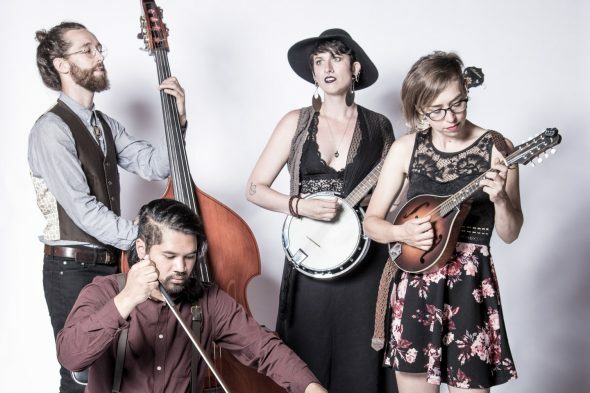 The band formed organically with both Matthew (upright bass) and Suzanne (trumpet and mandolin) approaching her separately after seeing her perform solo. Vimul (cello and saw) joined the band about a year later, but he and Francesca had been playing music together for about 10 years. Ghostly Hounds’ live performance has been described as an ethereal, captivating and emotional experience. We will have with us our debut full-length album which was released this past July. We are very excited about Tank and the Bangas and Rodriguez!